If you have tooth pain, you may require a root canal. Canyon Dental Centre provides root canal therapy for patients in North Vancouver. A root canal is a treatment used to repair and save a tooth that is badly decayed, cracked, traumatized or becomes infected. How does the root canal procedure work? During a root canal procedure, the nerve and pulp are removed and the inside of the tooth is cleaned, disinfected and sealed. Without treatment, the tissue surrounding the tooth will become infected and abscesses may form. The Dental Operating Microscope that Dr. van As uses is of tremendous benefit in root canal therapy. The high magnification and illumination from the microscope allow him to peer deep into the tooth to help find extra or calcified nerve canals and to more thoroughly treat your tooth the first time it bothers you. The vast majority of root canals can be treated in our office due to the utilization of the microscope. How might I know that I need a root canal? Building long-term relationships with my patients is not only practical in providing them with effective dental care. It's also one of the most rewarding aspects of my practice. I love working with my patients to help them achieve their oral health goals. 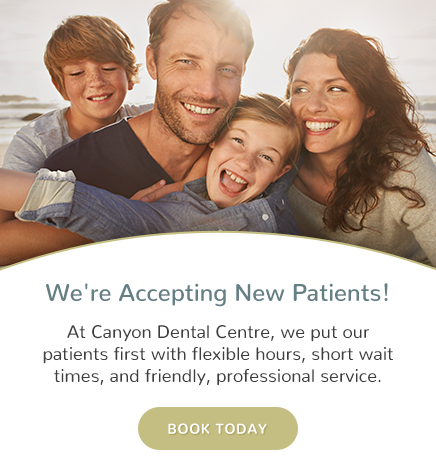 Meet the Canyon Dental Centre Team. Book your initial appointment with us today!